Yachtsman Tony Bullimore has had to abandon his solo round-the-world record bid after losing an essential bolt. It left the sail on his 102ft catamaran Doha on the brink of falling down. The Bristol-based sailor, 67, was 10 days into an attempt to beat Dame Ellen MacArthur's 2005 record of 71 days, 14 hours and 18 minutes. Bullimore, who famously capsized in the Southern Ocean in 1997, said he was devastated to halt the journey, but would try again later in the year. The missing bolt had been holding a pin on the forestay, a piece of rigging attaching the mast to the bow of the vessel. "If the pin had pulled out completely, the rig would have fallen down and I would have been left adrift," said Bullimore. "When I found it during a daylight check of the rig a few days ago, my heart almost stopped. "With the rig under so much tension, there is no way of banging the pin back in place. "In fact, it is the tension that has stopped it from falling out altogether." The start of his 27,000-mile journey had already been delayed several times by bad weather. "I'm devastated, particularly after the promising start I had from Hobart (Australia) when I was running ahead of the record," Bullimore added. "I can only assume that the retaining bolt came loose during the bashing Doha received in the 50-knot winds experienced a week ago. "All I can say is thank goodness it happened now and not when I was deep in the Southern Ocean or close to Cape Horn." The rig has now been secured and Bullimore is sailing under reduced canvas northwards to New Zealand. 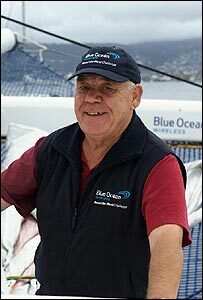 Once repairs have been completed, he will return to Hobart and restart the Blue Ocean Wireless Round the World Challenge later in the year. Bullimore memorably capsized in the Southern Ocean in 1997 during the Vendee Globe solo non-stop race and spent five days in the upturned hull of his yacht. He was eventually rescued by the Australian Air Force and Navy.